When I think of some of my favorite meals from my meat-eating days, classic Italian meatballs definitely top the list. Whether on a sub sandwich, over pasta or even on pizza (shout out to Dewey’s Pizza in STL), meatballs are the bomb. Whenever my parents come to visit me in NYC, one of their go-to eateries is The Meatball Shop. It’s a favorite of mine as well, and I’ve been lucky enough to live within walking to two of their locations over the past five years. The concept of this trendy yet casual local chain of restaurants is actually really cool. Using dry erase markers, you choose what you want by “checking it off” on a laminated menu. You choose the type of ball (beef, pork etc) and the sauce (pesto, cream, tomato etc.) and then the preparation (hero, over pasta, alongside steamed spinach etc). Whenever I say that I love The Meatball Shop, I’m undoubtedly asked how that is possible when I don’t eat meat. Easy answer. One of the ball options is a delicious veggie ball, and I like it best as either a hero sandwich or in “the kitchen sink” market plate form. No matter what preparation I choose, when choosing a sauce, I always go for the classic tomato sauce with a side of their silky parmesan cream sauce. I think subconsciously the idea for a veggie ball hero with tomato cream sauce was inspired by my typical order at The Meatball Shop. And it was a delicious idea. I spent literally all of this past Sunday in the kitchen making my own veggie balls, vegan cashew cream and a homemade vodka sauce. I always love spending hours in the kitchen, but this particular meal turned out perfectly, so this was a long but particularly rewarding cooking sesh. The recipe I’m sharing in this post is one of my favorite ways to make veggie balls, a Roasted Eggplant and White Bean Veggie Ball. The inspiration for an eggplant-based veggie ball comes from Matt. A year or two ago, Matt made us a batch of roasted eggplant balls stuffed with fresh mozzarella, and they were so tasty. My variation uses the roasted eggplant and then I also added some white canellini beans for a protein boost and some hearty substance. These meat-less meatballs are my favorite for a few reasons; they are super flavorful and yummy, they stay together and hold their shape, and they contain no eggs dairy making them vegan friendly. But mostly I love them because of how delicious they are. The balls get their amazing flavor from sweet roasted eggplant, fresh basil, and lots of garlic. Other than all-natural whole wheat bread crumbs and some additional seasoning and a bit of olive oil, that’s all you need to create these fabulous balls. I recommend making a double batch and use them in different ways throughout the week. I should’ve made a double batch on Sunday because this batch was gone by Monday. Slice eggplant into 1″ discs. Cube each disc into 4-10 cubes, depending on disc size. Soak eggplant in a bowl of cold water for 45-90 minutes, tossing occasionally. Rinse eggplant cubes and drain in colander. Use a clean towel to remove excess moisture. Toss eggplant cubes with 1 tablespoon olive oil and 1 teaspoon salt. Bake at 400 degrees for about 40 minutes, tossing half way through cooking. Allow eggplant to cool slightly. I put it in a the food processor with the top on for a few minutes to release some liquid. Combine eggplant, canellini beans, basil leaves, 4 cloves garlic and 1/2 teaspoon sea salt. Pulse until a smooth mixture begins to form, be sure to keep a little texture. Pour eggplant mixture into a bowl. Stir in 1/4 cup bread crumbs and 1 tablespoon nutritional yeast. In a small bowl, combine 1/4 cup bread crumbs, 1/4 teaspoon salt, 1/4 teaspoon garlic powder and 1 teaspoon olive oil. Form eggplant mixture into balls (I used a 1/4 cup measure for each). Toss each ball in the breadcrumb & oil mixture. Place coated balls on a parchment lined baking sheet. I got 9 balls out of this batch. Oh yum! These look delicious. Aww! Thx for stopping by! Love your blog and your posts… really nice layout and headings!! Your posts though are just what I have been looking for…some vegetarian/vegan recipes!! Can’t wait to try some! Oh my goodness, they sound so good. What a great change from the typical black bean burger I make. I will give this a try soon. 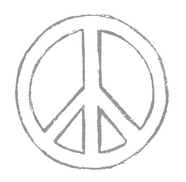 By the way, love your top logo with the peace sign, heart and apple. So happy to hear you love the logo! Peace, love and food…it’s what life’s all about! Let me know if you give these veggie balls a try. Thx for stopping by!